PITTSBURGH (AP) — The Pittsburgh Steelers will be on the field during the national anthem in next weekend’s game against the Baltimore Ravens. 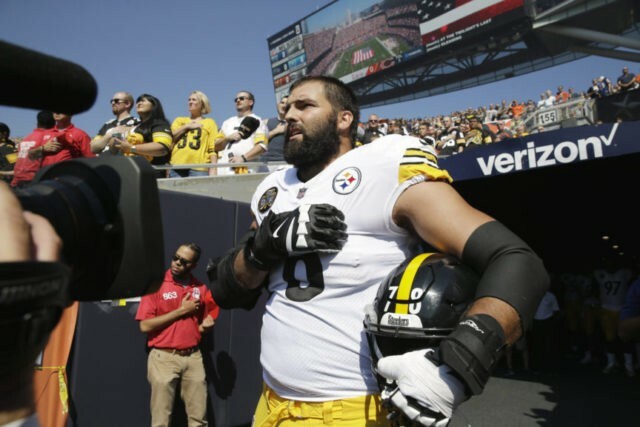 Every Steeler but left tackle Alejandro Villanueva remained in a tunnel while the anthem played before a loss in Chicago on Sunday. Ben Roethlisberger says the team asked Villanueva to join the other captains at the front of the line before kickoff and a miscommunication led to Villanueva, a West Point graduate and Army veteran, being left alone by the field. Defensive end Cam Heyward says the Steelers never wanted Villanueva to feel like his teammates don’t have his back. Heyward says Villanueva was shocked by the picture of him standing alone. Roethlisberger says the team hasn’t decided yet whether players will stand or kneel during the anthem in Baltimore.